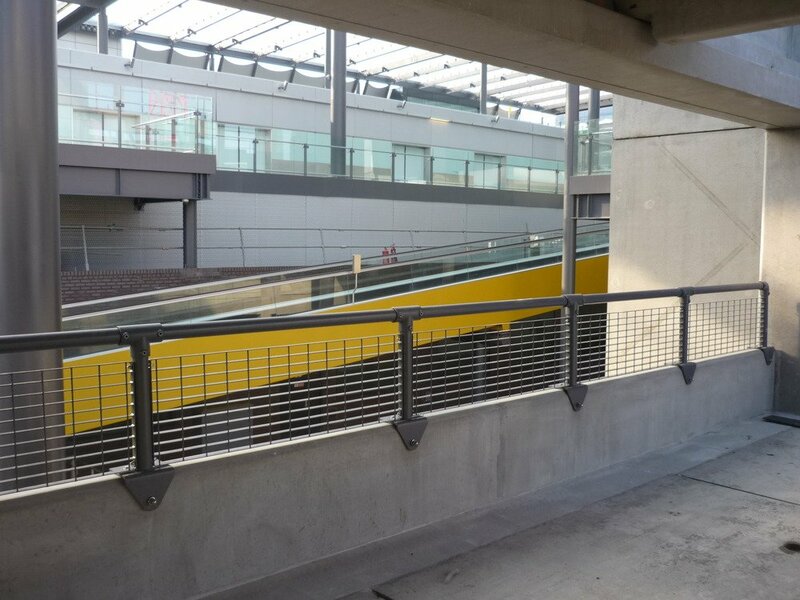 British Standard Gratings (BSG), specialists in industrial flooring and handrailing and suppliers of Kee Safety products, has recently provided tubular fittings and gratings to create a bespoke safety barrier within a multi-storey car park at London’s Gatwick Airport. The Airport’s car-parking expansion programme has seen a new 1300 space car-park constructed adjacent to the North Terminal. The restricted site programme time, demanded that any specified solution needed to be aesthetically pleasing and quick to erect. BSG were contracted by the Design Build Contractor for the project SCC Ltd to supply gratings and tubular fittings which were used to construct a bespoke, parapet barrier solution for the car park. BSG supplied a system featuring tubular fittings, with the addition of gratings inside the balustrades. This type of grating is normally used horizontally for industrial flooring. BSG spotted the opportunity to enhance these safety barriers by installing the mesh grating, powder coated to protect it from external conditions and ensure a long life. This will minimise the need for replacement or upgrading through wear and tear. However, should the locations requirements change, the fixture is also designed so that it can be easily replaced, removed or altered, with relative ease. Priding themselves on solutions which can be easily adapted to different situations, BSG were able to provide a solution which fitted the exact specifications required for the multi-storey car parking facility. BSG, a Kee Safety company, supply and manufacture industrial safety products such as steel gratings, hand-railing and edge protection solutions for varying requirements. For more information on the products that BSG can provide, please visit www.bsgratings.com.